Candles are perhaps one of the most enjoyable and affordable luxury items out there. They can create a special warmth and ambiance, infuse the home with color and fragrance, and bring a special sense of calm and well-being. Compare and shop for all natural soy aromatherapy candles or... find out how safe your candles are with our product ingredient review. Synthetic fragrance is the most common ingredient found in personal care products and is a known trigger of asthma. Many of the compounds in synthetic fragrances are suspected or proven carcinogens. Phthalates in perfumes are known hormone disrupters. Enjoy the relaxing and therapeutic benefits of Aromatherapy scents by using candles and room mists ... BUT ... just make sure the wax in your candles is vegetable-based and use a natural air freshener to avoid fogging up the air with synthetic chemicals. 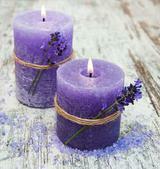 Burning candles that contain petroleum based paraffin wax, release toxic air contaminants which can harm your family. Side Note: Most high End gift stores or companies will use a SOY BLEND, soy wax plus Petroleum based paraffin wax in their candles...just so they can say the word SOY on their candles. Any paraffin wax will pollute your home with soot and toxify the air quality. Paraffin candles contain up to 11 carcinogenic compounds. These 11 compounds have been deemed 'toxic air contaminants' by the State of California. Paraffin wax candle soot particles contain many of the same compounds given off from burning diesel fuel. Pollutants in homes are 5 to 70 times higher than the highest outdoor levels due to Paraffin wax candle burning. Burning Paraffin wax candles pollute your home. How Safe Is Your Fragrance? All natural aromatherapy candles are an excellent and healthier alternative to commercial candles. Not only do they smell wonderful, they are safer and burn cleaner! Keep it simple and safe with all Natural Aromatherapy Candles & Aromamists for your aromatherapy needs. Choose Natural Aromatherapy Candles, because you ARE worth it! Paraffin is a by-product of the petroleum refinery industry, leftover residue of refined petroleum. Soot given off from burning paraffin candles is the same as burning diesel fuel or fumes from a diesel engine. Soot particles travel deep into the lungs. Breathing soot is not recommended at all! Tests show that paraffin candles can produce a variety of harmful substances, including benzene & toluene, known carcinogens. Testing by the EPA (Environmental Protection Agency) has found over 20 dangerous compounds in SIGNIFICANT quantities including acetone, benzene, toluene and lead. The soot from these materials can contain carcinogens, neurotoxins and reproductive toxins.